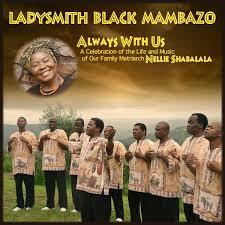 One Ladysmith Black Mambazo need no introduction. Their music soothes and unsettles me at the same time. They make me homesick for a time long past, at home with my family before my father’s passing, in Malawi – for the beauty and security of a time of my life shot through with laughter and love that I took for granted and will always treasure. Their new album, Always With Us, is dedicated to the memory of Nellie Shabalala, wife of Joseph Shabalala, the band co-founder. An American news station did an interview with the band, with songs. Two Sharon Jones and the Dap Kings. I haven’t been able to shake their new song Retreat out of my head for weeks. It’s an unapologetic, fierce song that turns the usual “Come hither” soul song on its head. Their new album, Give the People What They Want, is a sort of soul-funk homage. Sharon Jones was recently diagnosed with cancer, which pushed the alblum launch back, which might be why they opted for a cartoon video for Retreat, but I have to say I would have preferred to see her in it. Three Hot 8 Brass Band. I blog about them all the time, so I won’t go on. But here’s their cover of Rastafunk. I wrote something more personal than usual, for Open Democracy. What sort of country to do you want to live in? I ask that question because one of the great fallacies of the government’s hostile environment campaign is that you can isolate a group of people – in this case, to hive off the undocumented migrants from everyone else. First off, I don’t believe we should seek to exclude a group people, some of whom will be extremely vulnerable to exploitation, simply because for one reason or another they don’t have papers. Immigration status is a complicated web of rules that seems designed to catch you out, speaking as a migrant here. But secondly, I also believe that you can’t. Just as you can’t separate one group of migrants from another, you can’t introduce punitive legislation that intrudes so much on migrant’s private lives without the rest of society being sucked into the net. We are told that because of health tourism – an issue that has been talked up and despite estimates, is hard to quantify, students and other categories of temporary migrants will have to pay to use the NHS. And changes to the rules on ‘ordinary residence’ could mean that until you have indefinite leave to remain – a process that can take roughly to six years – you’d be paying for the service, even if you’re working legally here and paying taxes including National Insurance. Many believe that this is the thin end of the wedge in terms of introducing charges for the NHS – but it also introduces an administrative burden on health professionals to check everyone’s immigration status. Otherwise, how do you know who is a migrant? The same question is being asked at Universities. When Media Diversified – @WritersofColour if you’re on twitter, hosted a discussion on immigration, lecturers tweeted us about their discomfort at having to snoop on their students to comply with immigration rules, something that was raised in a letter sent to the Guardian newspaper by 160 academics last month. International students are feeling it. In an NUS survey over 50% of international students said the UK government wasn’t welcoming. When asked to name specific measures that bothered them, 74 per cent cited the NHS levy, and 40 per cent cited moves to get landlords to check on their legal status. Which brings me to my third example: housing. Last year the BBC uncovered routine discrimination against Black people by letting agents in the private rental market – a situation which will likely be exacerbated if we ask landlords- who are not regulated – to start investigating people’s immigration status. For starters, the paperwork isn’t straightforward. But also, will they want to go to the trouble, or will it be easier to just turn away anyone who looks or seems foreign? At the beginning of my little intervention I should really have asked, do you fancy working for the UKBA? Because that’s what the government proposes to ask doctors, nurses, lecturers and landlords – among others – to do. We are all being asked to consider our neighbour as immigrants first and people second. And if you seem “foreign”, you’re probably more likely to be asked these questions. These policies risk driving a wedge of suspicion into communities and dragging a lot of ordinary people into a net of surveillance. So – what kind of society do you want to live in? And more importantly, what are we, the young generation, the open generation, the future of this country, going to do about it? I’m so honoured to be here with all of you, and those joining us online and around the UK, to ask these questions. And I’m grateful to Open Generation and the Migrant Rights Network for hosting this important conversation and for inviting me to take part, and for all the vital advocacy work that they do. Thank you very much. Last week, I participated in a dynamic, challenging event on immigration and the younger generation, organised by Open Generation, part of the Migrant Rights Network. Here is the video live stream of the event.